A law enforcement master’s degree can open the door to well-paying, rewarding careers at senior levels of law enforcement and justice administration. The Bureau of Labor Statistics predicts steady annual job growth for a number of senior-level positions like police lieutenant and detective lieutenant over the next decade. Both positions pay, on average, $23,240 more per year than their bachelor’s-level counterparts. Master’s programs teach real-world examples that prepare graduates with the advanced skills they’ll need to make a difference. A master’s in this field can also open the door to a number of important and exciting federal positions in investigations and counterterrorism. Online law enforcement degree programs explore the finer details of criminal justice administration, enforcement, and policy. Specific curricula vary, so it is important to consider your career goals and interests prior to selecting a program. Some curricula allow you to choose a concentration after you enroll, which may include criminal behavior, counterterrorism, emergency management, homeland security, justice administration, leadership and administration, and others. Other curricula are more narrowly tailored to a specific topic. If you’re unsure of your career goals, examine each school’s course offerings to get a sense of what you will learn. Also consider each program’s credit load and duration, as these tend to vary between schools. Many law enforcement master’s degree programs require at least one advanced research course, which is meant to enhance critical thinking and hands-on learning. Students should also expect to complete a thesis or capstone project to earn their degree. These are designed to take the criminal justice theory you’ve learned and apply it to concrete, real-world problems. Georgetown University ranks #1 on The 9 Best Online Master’s in Law Enforcement Programs! Based in Washington D.C., Georgetown University is an authority in the law enforcement and intelligence fields. Washington D.C. is perhaps the capital city of law enforcement, given the numerous security agencies and wide range of law enforcement administration job opportunities the city offers. As such, Georgetown’s master of professional studies in applied intelligence program — which includes a concentration in law enforcement intelligence — combines excellent professors with a great location to offer one of the nation’s strongest online law enforcement degrees. Students in the program must complete a 33-credit curriculum, which includes coursework in law enforcement operations intelligence, counterterrorism, issues in criminal justice, and organized crime. Students can choose to earn their credits online, in-person, or through a hybrid format and may pursue either full or part-time study. As the program is designed for working professionals, Georgetown’s program takes longer than many comparable offerings; most full-time students earn their law enforcement master’s degree from Georgetown in two years, while part-time students take up to five years to complete their degree. While there are no in-person requirements for the program, each student must complete a capstone project in either public or private sector intelligence. All students pay the exact same tuition in Georgetown’s program. As the school’s program aims to leverage its unique location in Washington D.C., many of the program’s students go on to work in government intelligence agencies as intelligence analysts or specialists after graduation. Georgetown University is regionally accredited by the Middle States Commission on Higher Education (MSCHE). University of Cincinnati ranks #2 on The 9 Best Online Master’s in Law Enforcement Programs! The University of Cincinnati’s master of science in criminal justice program — which refers to itself as “the CJ program” and includes an optional concentration in law enforcement/crime prevention — boasts an impressive history. Unlike comparable online master’s in law enforcement management offerings, UC’s program is quite established; the online CJ program has existed since 1993, and has graduated over 2,000 students. In addition, the program’s faculty is the most prolific group in the United States in terms of criminal justice-related publications, according to the Journal of Criminal Justice. The program itself consists of a total of 11 courses, or 33 semester hours. Most students commit to part-time study, earning their degree over the course of six 15-week semesters, or two years. However, full-time students can complete the program in a single year. In addition to a broad foundation in the criminal justice field, students who pursue the law enforcement concentration complete theory and practice courses in crime prevention, law enforcement, effective policing, and law and social control. Students do not need to have a background in criminal justice or submit GRE scores to apply. However, UC prefers applicants who have earned a minimum undergraduate GPA of 3.0. Applicants who earned a minimum GPA of 2.75 can gain admission if they have five years of criminal justice experience, at least nine hours of graduate classes with a GPA of at least 3.0, or a score of at least 300 on the GRE. Transfer students may apply up to nine approved credits toward their degree. Although out-of-state online students are not able to pay the same tuition rate as Ohio residents, their rate is only $15 per-credit higher than in-state tuition. The University of Cincinnati is regionally accredited by the Higher Learning Commission (HLC). 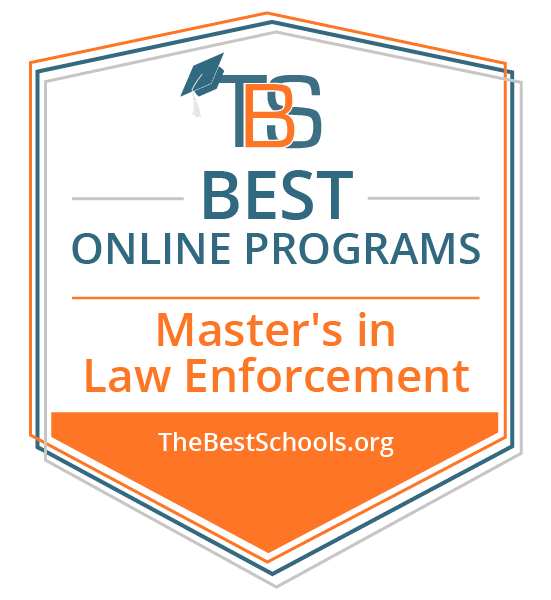 Saint Leo University ranks #3 on The 9 Best Online Master’s in Law Enforcement Programs! Saint Leo University — a Roman Catholic-affiliated school based in the eponymous city of St. Leo, Florida — offers perhaps the nation’s widest variety of master’s in law enforcement administration online degrees. The school’s master of science in criminal justice program offers six optional concentrations: corrections, critical incident management, behavioral studies, criminal investigation, forensic science, and legal studies. As Saint Leo focuses primarily on liberal arts, this wide variety of concentrations reflects the school’s goals. In addition, the school’s background as a military college ensures that Saint Leo is an authority when it comes to criminal justice. Though each of Saint Leo’s criminal justice programs is different, they all share certain characteristics in common. Each program requires students to complete a total of 36 credits, which include 9-12 credits of concentration courses. Though the programs do not require any in-person elements, students in each program must complete an applied project in the field as a capstone experience. Saint Leo offers its online programs asynchronously, to cater to working professionals in the criminal justice field who often work unconventional hours. For this reason, the amount of time it takes to complete these programs varies a fair amount. Saint Leo requires that applicants to the program submit proof of an undergraduate GPA of at least 3.0. Students who earned less than a 3.0 must submit a personal statement detailing why they believe they can maintain a GPA of 3.0 in an academically rigorous graduate program. Transfer students may apply up to 6 credits toward their online law enforcement degree at Saint Leo, provided they earned a grade of “B” or better. Saint Leo is regionally accredited by the Southern Association of Colleges and Schools Commission on Colleges (SACS). Michigan State University ranks #4 on The 9 Best Online Master’s in Law Enforcement Programs! Based out of East Lansing, Michigan State University is one of the Great Lake State’s two flagship universities. The school’s online department offers two distinct law enforcement master’s degrees: a master of science program in criminal justice and a master of science program in law enforcement intelligence and analysis. Both programs are offered entirely online, without any in-person requirements. The criminal justice program has been offered online since 1998. Students in the 30-credit program may choose between security management and judicial administration concentrations. Students are not required to write a master’s thesis — although they do have the option — but they must complete a policy analysis course as capstone experience. Transfer students may apply up to nine credits toward their degree, provided that they earned a grade of “B” or higher. The program is offered primarily asynchronously. Applicants must submit GRE scores if they earned an undergraduate GPA of lower than 3.2, which is the preferred threshold for acceptance. The law enforcement intelligence and analysis program is also offered also asynchronously and has the same requirements in terms of GPA and GRE scores. The program also requires students to complete 30 credits and includes a policy analysis course as a capstone. Coursework differs, however, as students complete studies in terrorism, counterterrorism, and the globalization of crime. Non-resident online students can pay the same per-credit tuition rate as Michigan residents in both programs. MSU is regionally accredited by the Higher Learning Commission (HLC). Saint Joseph’s University ranks #5 on The 9 Best Online Master’s in Law Enforcement Programs! A Jesuit-affiliated university based in suburban Philadelphia, Pennsylvania, Saint Joseph University has grown rapidly since the turn of the millenium. This growth includes a new physical campus, new buildings, new programs, and some unexpectedly competitive basketball teams, given SJU’s small size. SJU’s distance learning department has also expanded, and it now offers an excellent master of science program in criminal justice, which includes a concentration in federal law enforcement. SJU’s online law enforcement degree highlights a specific focus on federal law enforcement, relative proximity to Washington D.C., and connections with agencies like the CIA, DHS (Department of Homeland Security), and FBI as unique program elements. The 30-credit curriculum includes a total of 10 courses: four core courses, two specialized courses, two federal law enforcement (concentration) courses, and two electives. Federal law enforcement coursework includes studies in federal criminal justice, terrorism, homeland security, and federal criminal law/prosecution. The curriculum does not include a capstone requirement, and students can complete their degree from home, as coursework never requires students to visit the City of Brotherly Love. The program offers its courses asynchronously. A typical post-graduate job for top graduates of the program is FBI profiler. Most students complete their degree in about 18 months, and each student in the program pays the same per-credit tuition regardless of location. SJU does not list minimum GPA or standardized test requirements in its admissions requirements, but all applicants must submit transcripts and two letters of recommendation. SJU is regionally accredited by the Middle States Association of Colleges and Schools (MSCHE). University of San Diego ranks among The 9 Best Online Master’s in Law Enforcement Programs! A private, Roman Catholic-affiliated university based in the eponymous Southern California city, the University of San Diego operates a focused distance learning department, offering a total of four online programs. Fortunately for students seeking a law enforcement master’s degree, one of these programs is USD’s master of science degree in law enforcement and public safety leadership. Designed primarily for professionals already working in the law enforcement field — FBI workers, TSA employees, marshals, and campus safety officers, for example — the program aims to help working students gain the skills necessary for leadership positions. The program’s 11-course, 31-unit curriculum requires five semesters — or about 20 months — to complete, and students can earn their degree without ever having to travel to San Diego. The curriculum includes studies in organizational leadership, community assessment, and conflict resolution. In addition, all students must complete an integrative capstone course, during which students create a professional portfolio of projects, papers, and presentations, which ultimately becomes a tool for students’ post-graduate employment search. USD’s online programs are offered almost exclusively asynchronously. In order to gain admission to USD’s law enforcement and public safety leadership program, applicants should have earned an undergraduate GPA of at least 2.75. Students who don’t meet this requirement must also submit GRE or MAT scores. USD also prefers applicants who have some professional experience in law enforcement. Transfer students may apply up to six approved credits toward their degree. Though all students in the program pay the same per-credit tuition rate — regardless of whether or not they are citizens of the Golden State — individuals who are members of law enforcement or public safety unions or professional organizations receive discounted tuition. USD is regionally accredited by the Western Association of Schools and Colleges. Colorado State University—Global Campus ranks among The 9 Best Online Master’s in Law Enforcement Programs! Colorado State University–Global Campus is one of the Centennial State’s flagship universities. The Master's in Law Enforcement requires a total of 36 credits and allows the student to specialize their criminal justice focus, as students may choose between one of 14 four-course (12-credit) specializations. These specializations include finance, project management, healthcare administration, and human resource performance. The curriculum’s remaining 24 credits come from an eight-course core, which is relatively standard for an online law enforcement degree. Coursework includes studies in criminological theory, restorative justice, analytical methods, and applied research. The program also includes both a capstone experience and an internship, offering a unique focus on field experience. Aiming for flexibility, CSU–Global delivers all of its coursework asynchronously, eschewing set class times. All students in CSU–Global Campus' online programs benefit from tech support, access to the school’s virtual library, and SMARTHINKING tutoring services. Applicants to CSU–Global's criminal justice and law enforcement program must have earned a minimum undergraduate GPA of 3.0. Students who do not meet that GPA requirement may apply for provisional admission. Out of state students can pay the same tuition rate as Colorado residents in all of CSU–Global's online programs. Colorado State University–Global Campus is regionally accredited by the Higher Learning Commission (HLC). University of New Haven ranks among The 9 Best Online Master’s in Law Enforcement Programs! Primarily recognized for its engineering programs, the University of New Haven — based out of West Haven, Connecticut — also offers a couple of online law enforcement degree options. Those options include a master of science degree in criminal justice as well as a master of science degree in investigations, which includes optional concentrations in criminal investigations, financial crimes investigations, and digital forensics investigations. The two programs share certain commonalities. Both programs do not have any in-person requirements, as online students at New Haven never need to visit campus. Out of state students are able to pay the same tuition rate as Connecticut residents in both programs. In addition, active Connecticut police officers and firefighters receive a tuition discount in both programs. Neither program lists minimum GPA or standardized test requirements for admission, although applicants to both programs must submit letters of recommendation. However, that is where the similarities between the two programs end. While the investigations curriculum consists of 30 credits (10 courses) and requires a year of full-time study to complete, the criminal justice curriculum consists of 36 credits and generally requires two years to complete. Coursework in the two programs also differs greatly, as students in the criminal justice program learn about policing, victimology, and policy, while investigations students study contemporary fraud schemes, civil litigation, the Dark Web, and money laundering. In addition, students in the investigations program are able to earn professional certificates in their chosen concentration of criminal investigations, financial crimes investigations, or digital forensics investigations, while the criminal justice program does not offer professional certifications. New Haven is regionally accredited (which applies to both programs) by the New England Association of Schools and Colleges (NEASC-CIHE). Tiffin University ranks among The 9 Best Online Master’s in Law Enforcement Programs! Serving cities throughout Ohio — including Tiffin, Cleveland, Toledo, and Fremont — Tiffin University offers a wide variety of online law enforcement degrees. The school’s master of science in criminal justice program includes optional law enforcement-related concentrations in crime analysis, homeland security, homeland security administration, criminal behavior, and justice administration. The program’s top priority is flexibility, offering six start dates throughout the year and providing its coursework asynchronously. All applicants to the criminal justice program must have earned an undergraduate GPA of at least 3.0 to be considered for admission. Whether or not they live in Ohio, all students in Tiffin’s graduate criminal justice program are able to pay the same per-credit tuition rate. Tiffin University is regionally accredited by the Higher Learning Commission (HLC). Law enforcement officials with a master’s degree typically work in senior-level supervisory roles that coordinate the efforts of police officers, detectives, and other law enforcement professionals. Specific responsibilities include personnel management, scheduling, evaluating investigatory progress, writing reports, preparing for court, and more. Police Lieutenant: Police Lieutenants supervise and work alongside police officers, often acting as departmental managers. They ensure proper procedures are followed when police officers respond to calls or book suspected criminals. Lieutenants also serve as schedulers and shift supervisors. Detective Lieutenant: Like their police lieutenant counterparts, detective lieutenants supervise lower ranked detectives who investigate crimes to gather evidence for use in criminal cases. Detective lieutenants coordinate and review ongoing investigations, and develop them along the way as necessary. Commanding Officer Homicide Squad: Commanding officers of homicide squads coordinate the efforts of homicide detectives. A commanding officer’s job is administrative, but they must also visit scenes of homicides to lead the investigation and assign specific tasks to subordinates.